WA Bait Supply has been supplying quality recreational fishing bait in Western Australia since 1969. Proudly owned and operated by people that fish and understand the requirements of the recreational fishing sector. Operating from the original factory in Pakenham Street, Fremantle until September 2006 the business finally had to relocate to a larger and more modern factory in O’Connor to accommodate the growing market. Tony & Rhonda Westerberg are the new owners of WA Bait Supply as of 2015. They are passionate business owners (of Albany Seafoods) as well as being local fishermen in the South West of WA for the last 40+ years. They strive for quality produce for their customers and always source local when possible. Their son Bryn skippers the main boat which catches local Pilchards in Albany, which are then sold on by WA Bait Supply as well as Albany Seafoods. 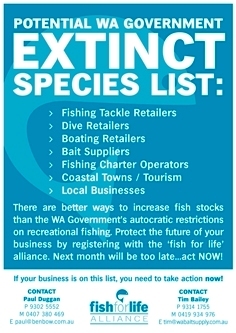 Their daughter Elle and her partner Jeff are running WA Bait Supply in Perth with the rest of the existing WA Bait team. Tony & Rhonda are aiming to have continuous supply of quality bait to you, the fisher man/woman. We appreciate your support and look forward to showing you guys what we are up to. No matter where you are in Western Australia, no matter what type of fish you hope to catch, WA Bait Supply can supply you with the bait that you require. We have an expansive list of retailers up and down the coast so there is no need to go fishing without the preferred choice in recreational fishing bait. On this website, you'll find all you need to know on what bait catches what fish, links to weather forecasts and wind conditions plus a heap of other info that makes fishing fun. We want to help you enjoy your fishing even More!